I jumped up and looked out the window at the pouring rain. Had lightening struck our house? No, but it hit a power line and knocked out our electricity. No air conditioning to cool the stagnant Florida heat. No appliances for a warm meal. No water (we have a well with an electric pump). I could have hugged the men from Duke Energy who came within the hour to repair the damage. If only I realized I need Christ's power even more than I need electricity. Blows away the stagnant errors in my mind (Romans 12:2). Brings light to my darkness (John 8:12). Sustains me better than a hot meal (Matthew 4:4). Gives me Living Water (John 7:38). 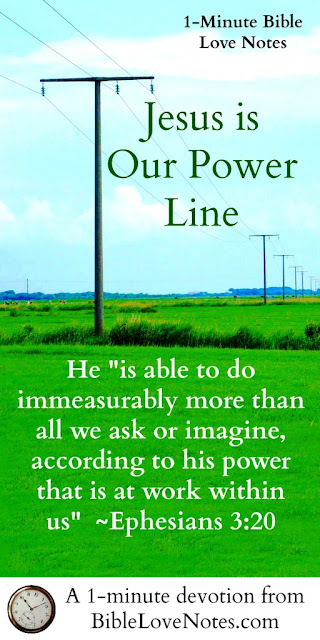 And the best part is that God's power lines don't go down unless we disconnect ourselves from prayer, God's Word, and fellowship (Philippians 2:12-13). 1. It's amazing that God promises to use His children so powerfully. And the praise for that goes to Him, not us. Ephesians 2:20-21: Now to him who is able to do immeasurably more than all we ask or imagine, according to his power that is at work within us, 21 to him be glory in the church and in Christ Jesus throughout all generations, for ever and ever! Amen. 2. Our job is to stay connected to His power. Romans 12:2: Do not conform to the pattern of this world, but be transformed by the renewing of your mind. Then you will be able to test and approve what God's will is--his good, pleasing and perfect will.